Joel Stransky won 22 Springbok Test caps but will forever be remembered for his performance in the historic 1995 World Cup final against New Zealand at Ellis Park where he scored all of South Africa’s points including a textbook drop goal late in extra time to clinch the William Web Ellis Cup for the Springboks. 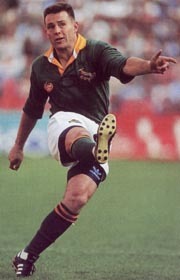 Stransky also wrote his name in the history books in the opening match of the 1995 World Cup when he became the first Springbok to score all four possible ways in a Test as he scored a try, a conversion, four penalties and a drop goal to guide South Africa to a 27-18 win over defending champions, Australia. Stransky made his Springbok bow against the Wallabies in Sydney on July 31, 1993 and scored his first international points a fortnight later with a memorable intercept try in the Test in Brisbane. He had a cunning running game, good distribution and could dictate games with his boot. After making his first-class debut with Northern Transvaal (Blue Bulls) in 1987, he transferred to the Sharks where he won a Currie Cup medal in 1990. 1994 saw him play for Western Province before he linked up with English club Leicester Tigers in 1997. He expressed his willingness to represent England in the 1999 World Cup as he believed he qualified through having an England-born grandfather. However, further checks revealed he had English-born great-grandparents and was therefore not eligible to represent England and subsequently retired later that year.